After a second edition which was completely sold out, the monograph including a special appendix Steel Helmet and Combat Equipment Colors is just coming. The appendix contains 5 more genuine lacquer paint chips. Limited edition. 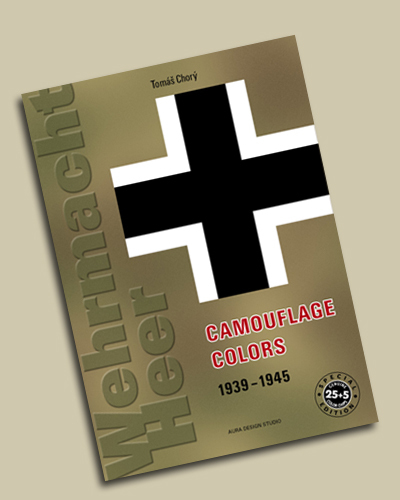 Chapters Camouflage Colors and RAL, Paints for Wehrmacht, Army Vehicles and Camouflage Colors in Action map out in detail development and aplication of army camo colors in a period of World War II. Either the book is accompanied by many original black and white and color photographs. Many of them have never been published. Color drawings prove development of camouflage schemes between 1939–1945. The Table covers 25 genuine lacquer paint chips, which are sprayed and pasted in, including the instruction for mixing. The tones outcome of available archival patterns and of a big amount of original parts of army vehicles and equipment. It is completed by references for RAL norm. Original charts, orders, and regulation either army abbreviations used between 1939–45 are enclosed in. English written version. 72 pages including 23 color pages, 25 genuine paint chips, format A4, coated paper 135 g/m2, unsewn binding. The appendix: 4 pages including 1 color page, 5 genuine paint chips. Payment method: PayPal. Discount for resellers.